The first time you enable a notification, an confirmation email will be sent to the other email address. The owner must login and confirm the request by clicking on the activation link. Enter the subject text that you want. It's possible to use keywords (read more below). Enter the body text that you want. 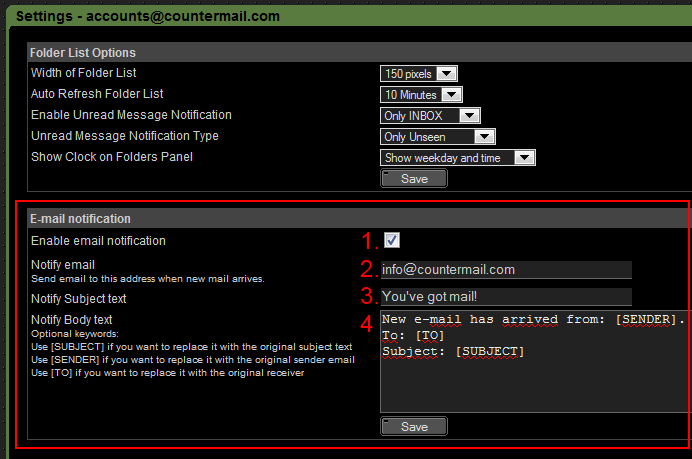 There are some optional keywords you can use, if you add the word [SENDER] it will be replaced with the sender email. The word [SUBJECT] will be replaced with the original Subject text. The word [TO] will be replaced with the original receiver email. Click on [Save] to store the settings. *=There is a delay between 1-6 minutes before the notification is sent. This delay is made on purpose to increase the protection against backtracking. Only new & unread messages will be notified, if you read the message before the notification is processed, no notification will be sent.